Hello! First, I’d like to say thanks to Jenny for letting me kick off this new guest post tradition on Savour the Senses! For those of you who don’t know me, I’m Ali B of Quarter Life Crisis. I started QLC back in May as a way to chronicle my journey through my mid-twenties. I have started to slowly find my path as I am back in school to become a teacher. Along the way, I have picked up many interests and hobbies, one of them being baking! A couple of months ago, my friends and I went apple picking. I got an entire bushel of apples thinking I’d plow through them in a couple of weeks. Well here it is, after Thanksgiving, and I still had all of these apples left. Luckily, they stayed perfectly fine in the fridge (which is pretty amazing considering it’s been about 8 weeks), but I was running out of things to do with them. That was until I found apple pie muffins on My Baking Addiction. I absolutely love apple pie and thought making them in muffin form would be amazing. I decided to opt out of the oat crumble top and substitute it with my own streusel topping. Making a streusel topping is much easier than one would think. You want your butter to be chilled, so take it out of the fridge about 5 minutes before you go to make the streusel topping (maybe while you’re filling your muffin wells?). Even though it is a little more difficult to cut when the butter is chilled, it’ll result in a streusel topping that isn’t too mushy. Your streusel will be a light brown color and crumbly when it’s finished. My topping had completely disappeared! It had sunk right into the cake. I figured out that either my cake didn’t have enough flour in it to support the topping or I should have let the cake bake a little longer before putting the topping on. 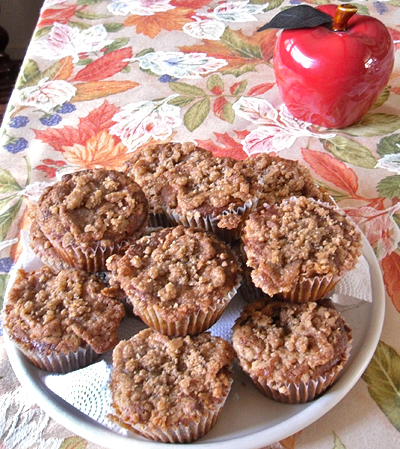 I did not want a repeat of this for my apple pie muffins, so I made sure the batter was nice and thick so the streusel topping would stay on top. I also decided to try both methods and put both pans in the oven at the same time, but just sprinkle the streusel topping over one pan. When I opened the oven after about 15 minutes, neither pan had the streusel topping on it. Go figure. 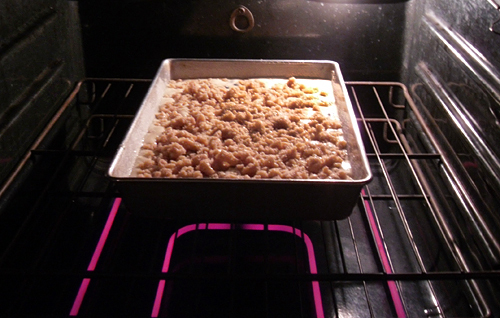 I pulled both pans out and added the streusel topping and placed them back in the oven for an additional 15 minutes. 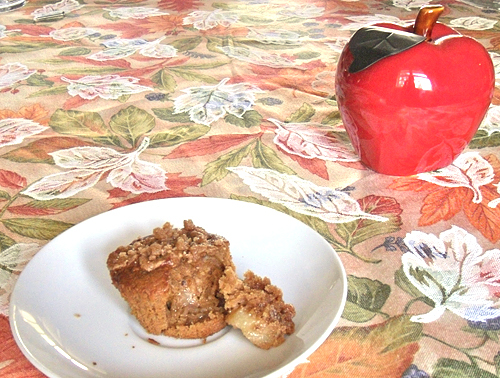 When I pulled them out a second time, the streusel topping hadn’t quite baked into the muffin, but it didn’t have that soft, crumbly look anymore. I sprinkled some more streusel on top and called it a day. When I stopped and thought about it, I realized I couldn’t expect the streusel topping to look exactly as it did when I put it in the oven, since the streusel topping’s main ingredient is butter and will not keep its form in a 375F oven…So what I would recommend doing is pulling the muffins out after about 20 minutes, sprinkling the streusel topping over them, and putting them back in the oven for about 5 minutes so they can crisp up. These muffins were so soft and delicious! The apples (if left in about ½ in pieces) didn’t cook into the muffin and were sweet and not too mushy, just like the filling of an actual apple pie. Next time, I may make them in cupcake form and fold in some caramel. But let’s be real here, muffins are cupcakes, we just call them muffins so we can have cupcakes for breakfast. These would also be such a treat for the morning after Thanksgiving. Or at 4:00AM while you’re waiting for the Toys R Us to open so you can be the first to get those coveted Air Swimmers eXtreme from Animal Planet (ok, let’s be honest here, how on Earth are you going to use that in your house?!). You will be so pumped up on carbs and good fats that you’ll leave your Black Friday competition in the dust. Happy eating shopping! Preheat oven to 375F and line 2 12-count muffin tin with liners. In a large bowl, sift together the flour, pumpkin pie spice, baking soda, and salt. Set aside. Pour brown sugar into a separate bowl. Pour melted butter over sugar and whisk until the sugar is dissolved. Add the egg, buttermilk, and vanilla extract and combine. Pour the wet ingredients into the dry ingredients and combine. Fold in the apples. Scoop the batter into the muffin wells, just about full. Place muffins in oven and bake for 20 minutes. While the muffins are baking, begin to make the streusel topping. Combine butter (slightly chilled), sugar, cinnamon, flour, and salt in a bowl and cut with a pastry blender until the butter is completely combined. 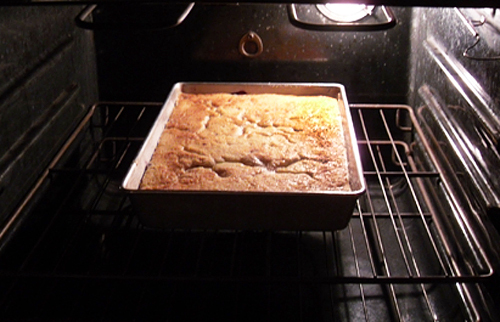 The mixture will be crumbly but soft and will become a light brown color. Set aside. Remove muffins from oven after 20 minutes and sprinkle streusel topping over top. Place back in oven and bake for an additional 5 minutes, or until the tops are golden brown and a toothpick inserted into the center comes out clean. Let cool in pan for about 5 minutes and then allow the muffins to finish cooling on a wire rack. *The larger your apple pieces, the less they’ll bake into the muffin. I cut my apple pieces into ½ in cubes so I could have bits of apple in my muffins. Thanks so much Ali! What a great recipe for the holidays and a great way to start off Featured Foodie Fridays! If you or somebody you know would like to be a part of this new tradition please e-mail me at savourthesenses (at) gmail (dot) com and we can get you scheduled! Those muffins look delicious. I love how you got around the streusel melting into the cake part of things. I have that happen all the time so I’m going to try your version next! Thank you for introducing me to a new blogger (for me). I’m going to head over and check Ali’s site! Looks wonderful! I adore the crumble crust, looks absolutely gorgeous. These look perfectly full of fall flavors with the apples and pumpkin pie spice! This seems like it would be a great new series. Great post! Yum yum!! Great post. Those muffins look so delicious, I am such a sucker for apple anything.